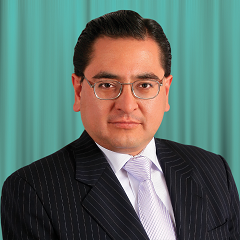 Juan Carlos Aranibar, a Balanced Scorecard expert based in Bolivia, who is officially certified by The Palladium Group. Today, I want to share with the readers an interview with Juan Carlos Aranibar (LinkedIn, Prezi), a Balanced Scorecard expert based in Bolivia, who is officially certified by The Palladium Group. His academic background includes studies in IT, Business Administration and Finance. Besides being an international lecturer and consultant in Business Intelligence and Balanced Scorecard around Latin America, his expertise covers business performance models for the mining industry for more than 20 years. His book, “Management Information Systems for Business Performance Management, the Convergence of Business Intelligence and Balanced Scorecard,” has been sold in more than 8 countries, including USA and Spain. Aleksey: Juan Carlos, thank you for this opportunity to ask you some questions about the Balanced Scorecard framework and the partnership with BSC Designer. How did you get started in the area of performance management and specifically with the Balanced Scorecard framework? Juan Carlos: A long time ago, as the leader of the IT area in a mining company, I felt the need to monitor how well/bad we were doing in compliance of our IT plan aligned to our strategic plan. In addition, the corporation suggested for us to manage some measures regarding budget use: IT service, infrastructure availability and projects. In this way, I started to do research on the performance models. The Balance Scorecard called my attention. It was provided as a structured way to organize key performance indicators, performance drivers and strategic initiatives. Also, it helped to track value creation through the conversion of intangible assets into tangible ones using a strategic map that was showing the cause-effect relations of objectives. In the case of IT, this was even more important because it became critical to understand its contribution to the company. Aleksey: Why do you think the Balanced Scorecard framework is so popular among business professionals, especially in Latin America countries? Juan Carlos: In Latin America, as it can be supposed, big companies are similar to medium ones of the developed economies. So, in terms of the number of cases, the scenario for organizations are mainly based on small and medium-sized companies which have the understandable intention to grow, to be global, grow financially, break into unknown markets, optimize processes to reduce costs, apply best practices or standards, or finally to survive. This way, professionals are very interested in organizational performance tools based on effective methodologies, which are easy to understand and to implement and are within easy reach. Aleksey: What are the most important goals that organizations want to achieve by implementing strategy execution framework? Juan Carlos: I think making things happen in a chain of conditions. One of the reasons for failing strategy execution is the lack of a formal methodology and wrong tools. Aleksey: According to your experience, what are the key factors of a successful Balanced Scorecard implementation? The first factors are related to the use of an appropriate tool representing a performance model. It should include linked objectives and point towards value generation in terms of tangible assets. Another factor regards the usage of the right key performance indicators (or lag indicators), but mainly, the right performance drivers (lead indicators) that determine the behavior of the lag indicators. And the last factor refers to the human factor, because an appropriate engaging of the main actors of the model, including the top management sponsorship, is very important. I could formulate an implementation success summary: use the right tool to represent the right model to the right participants. Aleksey: If a strategist in the organization had limited resources, what would be the 2-3 simple things that he or she could do right now to get the strategy execution on the right track? Juan Carlos: Budget is always an important thing to consider in the process of having a good scenario of strategy execution. A strategist with limited resources should pay special attention to acquiring a low-cost tool, destining specialized staff (probably one representative is enough) and taking the strategic planning and controlling processes very seriously. This is a way to change organizational culture proactively towards an inherent performance management in the organization. Aleksey: What about specialized automation software? Is there a real need for it or an organization can solve their needs using MS Excel Spreadsheets? 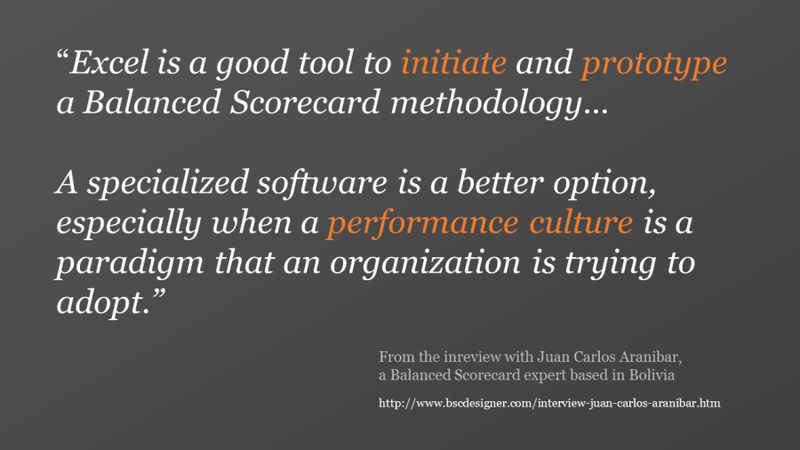 Juan Carlos: Excel is a good tool to initiate and prototype a Balanced Scorecard methodology. In the last versions are available complementary features to automatize information modelling, extraction and visualization. However, there is no way to manage strategic maps as native, and other tasks that deal with advanced dashboards. In fact, Excel is not a tool to manage dashboarding capabilities in a sophisticated way. It is possible to draw a map linking bubbles or circles, but it is complex to make interaction with them because macros and other workarounds are needed, which means it is not an easy job to understand and maintain. For this reason, a specialized software is a better option, especially when a performance culture is a paradigm that an organization is trying to adopt. Aleksey: Different clients need different tools to address their needs… If what cases do you recommend BSC Designer tool? Who will benefit the most from its implementation? Lately, Cloud computing has been the option to facilitate many technical issues. Balanced Scorecard tools are not the exception, and in the case of BSC Designer Online, the service is quite efficient and enough for some scenarios. But if the organization wants to have owned the software in their installation, the desktop option is also effective. Aleksey: After the implementation of the strategy execution framework: how quickly can the organization expect to see the improvement? How should they measure the success of the implementation? Juan Carlos: Like all stuff related to organizational strategy, good news will come later. It could take months or even years to feel the impact of good data-driven decisions. The real situation of strategy execution framework is that the return on investment is quite hard to determine because it is reflected in: financing and investing decisions, market and development products, process improvements, better intangible assets management which means more value in tangible assets, and many more. These benefits are a result of translating better decisions in economic impact. Aleksey: What companies in Latin America are already doing the Balanced Scorecard well? Juan Carlos: There are a lot, but to be honest, most of them are applying just a part of the complete methodology. For example, there some companies with a good strategy map, but forgetting the lead indicators, or there are cases with a good set of lag and lead indicators, but without a portfolio of strategic initiatives; and so on. It is demonstrated that in a scenario with some absent elements, is hard to understand the real contribution that the methodology could give to the performance management system in the company. I know about many industries like mining, oil, food, financial services, retail, educational institutions, pharmaceuticals laboratories, healthcare, telecom, public institutions, NGOs, international cooperation, construction, power energy, insurance, tourism, and many others. In fact, I applied advisory work to many of these cases. One of the latest versions of the Hall of Fame of Palladium Group includes formally these latin organizations: Banco Estado, Unibanco, Compartamos Banco, Chilectra, Federación Nacional de Cafeteros de Colombia, Megasalud, Delta Dental, Unimed, Minera Los Pelambres, Polibrasil, Cablevisión, Atento, Brasil Kirin, Grupo Modelo, and Cinépolis. Some of them are quite big in the latin context. Aleksey: What is a profile of your typical client? Juan Carlos: Business issues related to performance are present in all kind of organizations and business functions. I have worked from top strategic level with big and small organizations through performance model design for projects and operative teams and employees. However, I realized at the beginning of my incursion on this paradigm that areas like HR and Sales were the most interested in applying the Balanced Scorecard. Also, I have developed a lot of Balanced Scorecard models and their elements for extractive industries, like mining and oil/gas. To be honest, I could see very low cases where the methodology has been requested to implement as a top management initiative, which should be regular. It is very common that BSC projects comes from specific functional area and then irradiate to all organization. A typical client has a scenario with a lot of unintegrated lag measures, does not know about performance drivers or lead indicators and value generation with causal model is unknown. On the other hand, Business Intelligence and Business Analytics are frequently obviated or simply discarded, with the corresponding effects of a risky, tedious and time-consuming manual job. Aleksey: If our readers would like to get more help with the Balanced Scorecard, what services can you offer them? Juan Carlos: I am a consultant around Latin America in many fields, but my specialization touches: Performance Management, Balanced Scorecard, Business Analytics and Business Intelligence, Business Process Management, and Strategic Planning. One of my most valuable strengths is my knowledge about the right convergence that an organization should apply using performance models and managerial information tools. BSC Designer is a Balanced Scorecard software that is helping companies to better formulate their strategies and make the process of strategy execution more tangible with KPIs. If you prefer to receive posts like these by email sign up to our newsletter. Whether you are looking for a professional Balanced Scorecard software, or just researching information about Balanced Scorecard and business strategies, we recommend you to download and try our BSC Designer software (no credit card is required).